By subscribing you will gain access to our library of resources, be the first to know about event dates and ticket sales, and receive new blog content directly to your inbox! I believe that God speaks to you and to me in some form or fashion every day. It may be through our thoughts, through words of encouragement from a friend, or maybe through a song you heard somewhere that was exactly what you needed to hear in that moment. The questions is, are we intentionally listening and expecting Him to speak? For the last four years, I have to honestly admit that most days I was not. When I was in college, I practiced listening to and receiving from God all the time. One of my favorite things to do was take my Hammock and head to Research Park for quality time with the Lord. “God told me” was a phrase I used on a regular basis. Then I graduated and got married and in two months time my whole world changed. Finding time alone became a challenge, mostly because I didn’t want to be alone, I wanted to be with my new hubby (duh!). In addition to the distractions of the newlywed phase, my daily routine looked drastically different than it did in college. Spending time with the Lord now required extreme intentionality and self discipline on my part. Unfortunately, I’m notoriously weak in both areas, and the “noises” of life quickly began to drown out God’s voice. Two years later I found myself on a marriage retreat/mission trip in New York City led by two couples from our church who are extremely good at hearing from the Lord (because they practice daily). It was there that the Lord began reawakening my desire to listen for and recognize his voice. After another year, the birth of our first child, and halfway through my pregnancy with our second child (more “noise”: good things that when made ultimate the enemy can use as a distraction), I found myself sitting in a class called “Loving Muslims (Supernaturally)”. It was there that I first heard the practical steps to hearing from God that I am sharing here today. The premise of these steps to hearing from God is that there are three sources of voices in our heads: the accuser, the Holy Spirit, and our flesh. The accuser’s voice will always be accusatory, often leading you to feel shame. The Holy Spirit may bring conviction, but in a way that reminds us of our need for Jesus, and brings us back into right relationship with God. When the Holy Spirit speaks, there is often a challenge, something that inspires us but feels risky or uncomfortable. The flesh is the voice we know all too well. Its the voice that speaks to our comfort zone and in my experience is the voice that the enemy wants me to mistake as the voice of the Holy Spirit. a) If it was the accuser, rebuke the thought in Jesus name and battle it with truth from scripture. Often the accuser speaks things to me like “It is impossible..”, “You’ll never be able to..”, “God doesn’t want that for you”, or the worst, “God can do it, but he won’t do it for you.” Since I’ve started putting this step into practice, I am able to recognize the accusers voice better, rebuke him, and move forward focused on the truths proclaimed in scripture. I’ve slept better, prayed with more boldness, and felt more confident in who the Lord says I am. b) If it was the Holy Spirit, receive it. Another good test as to whether the voice you heard was actually the Holy Spirit, is that it always takes faith to believe God, while it never takes faith to believe the accuser. c) If it was your flesh, bring the temptation you are being faced with before the Lord and ask Him to walk you through it. Often scripture or a worship song fills my mind when I am intentional about asking God to step in and deliver me from whatever is tempting me. 2. Ask the right kind of questions. A huge part of hearing from God is asking him to speak. He wants to have two way conversations with us, invite him in by asking the right kind of questions. Avoid questions about the future and questions with yes or no answers. 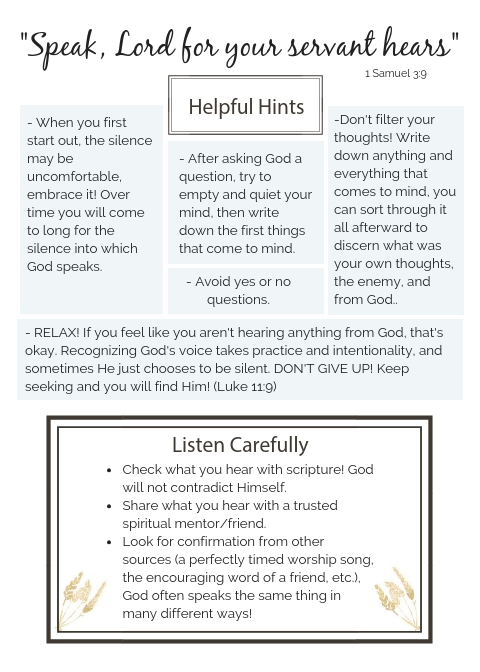 Try starting with, “Lord, what lies am I believing about myself” and “What is your truth about me?” When I did this the first time God said that the lies I was believing were: that I can do things on my own and I’m not enough. His truth about me was that I am a beloved daughter of the King. 3. Write down what you hear God say. Write down the first thing that pops into your mind after asking God a question. Don’t let doubt or questioning come in. This helps memorialize what God speaks to you so that you can come back to it later. 4. Check it with Scripture. This step is crucial friends. It is your built in safety net! If what you wrote down lines up with truths of scripture that is further confirmation that the voice you heard was the Holy Spirit. 5. Share what you hear. By sharing what you receive from the Lord with at least one TRUSTED believer you a) give glory to the Lord and b) are safe guarded against Satan’s schemes to confuse what the Lord is trying to speak to you. In college one of my best friends tried to speak truth to me when I came to her with “God told me to get back together with (insert ex boyfriends name here)”. She had the wisdom to recognize my own fleshly desires getting mixed up in what the Lord was trying to speak to me. Looking back I now realize that what God really wanted was for me to trust him completely in that area of my life – a lesson I learned the harder way when that relationship ended for the second time a few months later. Putting these principals into practice has been HUGE for my relationship with the Lord. 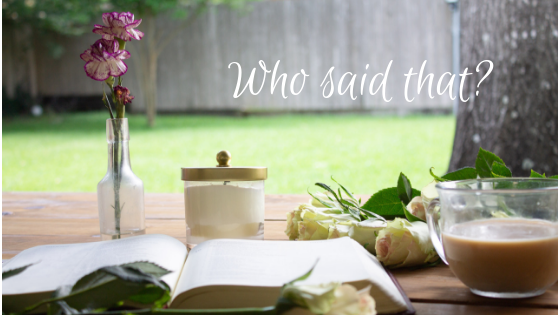 Being able to recognize and rebuke the enemy silenced so much of the nonsense in my head and allowed me to begin taking steps of faith in asking God to speak to me. Today I can confidently say I feel more in tune with the Holy Spirit than I did in college. Six months ago I would have told you it was impossible for me to feel that way (a lie from the enemy). If all of the steps seem like too much too fast, I challenge you to start with the first one. As a believer in Christ you have the authority of Christ. Start paying close attention to your thought life and going into battle against the enemy, capturing his condemnation and replacing it with God’s life giving truth. God’s word promises us, if we earnestly seek Him, He will show himself and as a result we can start to experience the freedom Christ died for us to enjoy (Matthew 7:7-8, Galations 5:1). 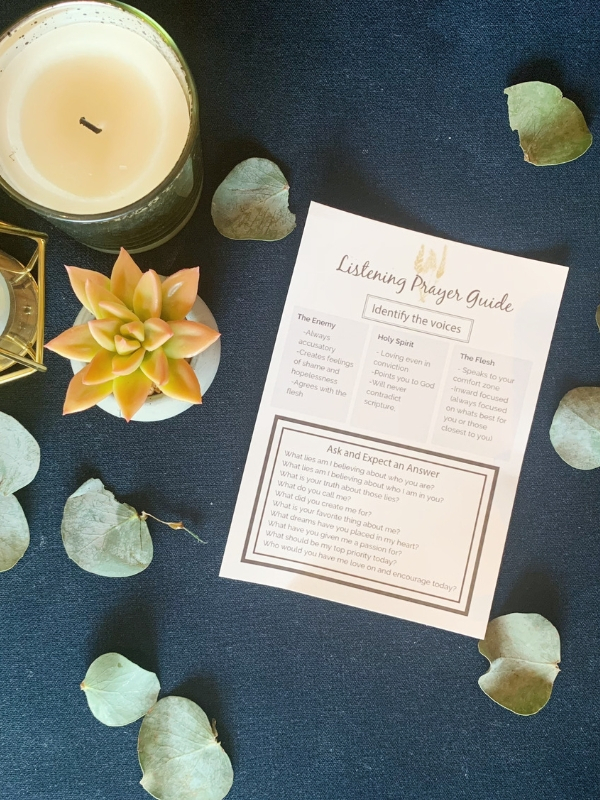 We’ve created a Listening Prayer Guide that is the perfect size to keep in your Bible for reference as you read and pray each day. Our hope is it will be a reminder to you to approach the Lord not just with a list of requests but to hear directly from Him, and that in doing so you will experience deeper intimacy with the Lord than ever before. Love our content? Help us spread the word!